Monera, in some systems of biological classification, is a kingdom that comprises most living things with a prokaryotic cell organization. For this reason, the kingdom also has been called Prokaryotae. Kingdom Monera historically included the bacteria, blue-green algae (cyanobacteria or blue-green bacteria), and the archaebacteria (Towle 1989). At times, four phyla of Kingdom Monera were recognized: Archaebacteria, Schizopyta (bacteria), Cyanophyta (the phytosynthetic cyanobacteria), and Prochlorophyta (symbiotic photosynthetic bacteria). However, the unique nature of the archaebacteria has led to classifications where they are not included with Monera. In the five kingdom system of biological classification, the other kingdoms are Protista, Fungi, Plantae, and Animalia. In the six kingdom system, the archaebacteria are separated into their own kingdom, Archaebacteria or Archaea. The history of the classification of bacteria and archaebacteria, and the use of the category Monera, reveals the nature of taxonomy (like science) to be dynamic, including clashes of doctrine and competing groups. Recently, this has manifested in a taxonomy where both Monera and, to a degree, the kingdom system are considered obsolete. Although the kingdom level traditionally was the highest level, since 1990, a higher classification level has been promoted called a "domain" or "superkingdom." It includes three major groups: The Archaea, Bacteria, and Eukaryota. Some place Monera as a kingdom under the domain Bacteria; however, in originator Carl Woese's popular three-domain system, Monera no longer exists, as life is divided into multiple main divisions incorporated within the three domains Bacteria, Archaea, and Eukarya. For two centuries, from the mid-eighteenth century until the mid-twentieth century, organisms were generally considered to belong to one of two kingdoms, Plantae (plants, including bacteria) or Animalia (animals, including protozoa). This system was proposed by Carolus Linnaeus in the mid-18th century. However, this classification had obvious difficulties, including the problem of placing fungi, protists, and prokaryotes. There are single-celled organisms that fall between the two categories, such as Euglena, that can photosynthesize food from sunlight and yet feed by consuming organic matter. In 1866, Ernst Haeckel proposed a three kingdom system that added Protista as a new kingdom that contained most microscopic organisms (Haeckel 1866). One of his eight major divisions of Protista was called Moneres. Haeckel's Moneres subcategory included known bacterial groups such as Vibrio. Haeckel's Protista kingdom also included eukaryotic organisms now classified as Protist. Later, Haeckel proposed a fourth kingdom, which he called Monera. It was later decided that Monera proved to be too diverse to be seriously considered one single kingdom. In 1969, Robert Whittaker published a proposed five kingdom system (Figure 1) for classification of living organisms (Whittaker 1969). Whittaker's system placed most single celled organisms into either the Monera (prokaryotes—bacteria and blue-green algae) or the Protista (eukaryotes). The other three kingdoms in his system were the eukaryotic Fungi, Animals, and Plants. This system was widely used for three decades, and remains popular today. Figure 2. A phylogenetic tree of living things, based on rRNA sequence data, showing the separation of bacteria, archaea, and eukaryotes. The three-domain system was introduced by Carl Woese in 1990 (Woese et al. 1990). One of the reasons such a classification has been developed is because research has revealed the unique nature of anaerobic bacteria (called Archaeobacteria, or simply Archaea). These "living fossils" are genetically and metabolically very different from oxygen-breathing organisms (Woese 1987). Based on molecular phylogeny studies, Woese proposed that the prokaryotes (monerans) be divided into two separate groups: Bacteria and Archaea. This gave three groupings: Archaea, Bacteria, and Eukaryota or Eukarya. In his 1990 proposed phylogeny (Woese et al. 1990), these three domains are all rooted in a universal common ancestor that Woese (1987) had speculated on earlier. This proposed phylogeny is the most widely accepted categorical phylogeny accepted today (see diagram to the right). However, the most modern interpretation for these three domains is the "Universal and Eukaryote Phylogenetic Tree" based on 16s rDNA as presented on the Tree of Life website (Sogin 2006). Some maintain the five-kingdom classification under the higher-level "domain" category. 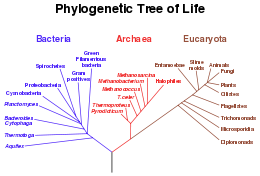 However, Woese's three domain system, based upon genetic relationships rather than obvious morphological similarities, divides life into 23 main divisions, all incorporated within the three domains of Bacteria, Archaea, and Eukarya. In this scheme, Kingdom Monera no longer exists. There are additional systems of biological classification in use. Some authorities, who recognize a need to separate bacteria and archaebacteria, nonetheless keep the kingdom system as the highest level classification, but add a sixth kingdom, the Archaebacteria. In this six-kingdom system, the Kingdom Monera remains. Coexisting with these schemes is one dividing living organisms into the two main divisions of prokaryote (cells that lack a nucleus: Bacteria, etc.) and eukaryote (cells that have a nucleus and membrane-bound organelles: Animals, plants, fungi, and protists). Overall, the majority of biologists accept the domain system, but a large minority uses the five-kingdom method. A small minority of scientists adds Archaea or Archaebacteria as a sixth kingdom but do not accept the domain method. Haeckel, E. 1866. Generelle Morphologie der Organismen. Berlin: Reimer. Sogin, M. L. 2006. Universal and eukaryote trees based on 16s rDNA. Tree of Life Website. Retrieved February 3, 2007. Whittaker, R. 1969. New concepts of kingdoms or organisms: Evolutionary relations are better represented by new classifications than by the traditional two kingdoms. Science 163: 150-160. Woese, C. R. 1987. Bacterial evolution. Microbiological Reviews 51(2):221-271. Woese, C. R., O. Kandler, and M. L. Wheelis. 1990. 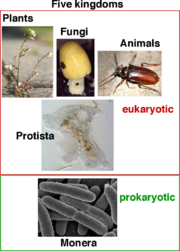 Towards a natural system of organisms: proposal for the domains Archaea, Bacteria, and Eucarya. Proceedings of the National Academy of Sciences U.S.A. 87: 4576-4579. This page was last modified on 3 April 2008, at 23:10.